As Emily Cadik noted in a recent Burnt Orange Report article, Texas doesn’t vote. For the 2010 mid-term elections, the state of Texas had voter turnout of 36.1 percent… dead last in the nation. 2008 was better at 56.1 percent (as is expected for a Presidential election), but that still only ranked at 45th out of 50 in the US. This isn’t exclusively a “big state” problem. Voter turnout in California is soaring, while New York in 2010 was one of the states lower than Texas. All three states also had Gubernatorial elections at the same time. This also isn’t exclusively a “red state” problem. Some reliably Conservative states like Mississippi have consistently higher turnout than Texas, though it’s still below the national average. Voter turnout is a Texas problem. Our voters are disengaged, and misinformed. As long as state campaigns and interest groups practice “uncertainty politics” it will continue to be this way. Besides voter apathy, Texans are plagued by signs that misdirect people to false voting locations, and incorrect times and dates of where to vote. And yes the current legal brawl over voter suppression makes the confusion this year higher than ever. But just imagine if those voters were more informed and more engaged? Texas would easily be a swing state the like of which the US hasn’t seen. As Nathan Pippenger states in his recent article from The New Republic, Texas isn’t on the radar as a swing state. But Democrats, with all of their challenges can make this happen in 2012. Here’s my plan of how to turn Texas into a swing state. Texas is huge, but when it comes to elections, it’s not as big as you think. 8 million Texans voted in the 2008 election, representing all 254 of the state’s counties. But as of the 2010 census, over half of all Texans live in just 13 of these counties, concentrated around the major urban areas. 12 of the 13 were “in play” for Democrats in 2008. 2008 also saw a huge sea change in the state. 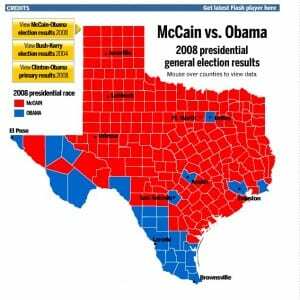 Some counties went so heavily for Obama that they can now be considered “reliably Democrat-leaning”… El Paso, Travis (Austin), Dallas, Webb, Hidalgo and Cameron… along with other portions of the Rio Grande Valley. Let’s consider these counties as Tier 1 targets for Texas Democrats. Gains made in the 2008 election should be kept and defended. We should be making sure democratic candidates are well-represented in the local media markets, signs and volunteers. It’s critical that these counties remain in the blue category not only for 2012, but to strengthen current networking for future elections. So now we’ve taken the vast 254, and narrowed it down to just 12 counties. These also happen to be the state’s most populous areas. 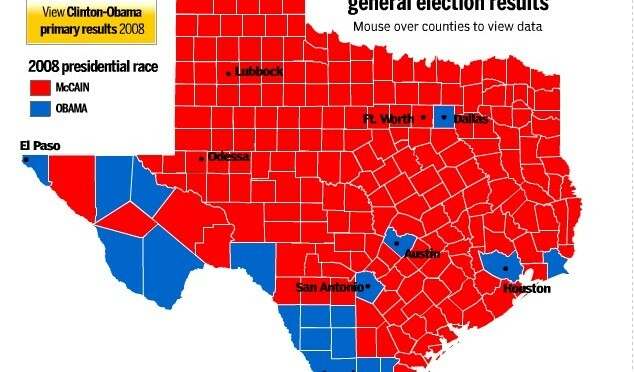 If Texas Democrats ever win all 12 of these counties, we are swing state, and possibly a BLUE state. This is the really super hard part, but it can be done. The one thing we also know from 2008… Democrats like to vote early. If voters are well informed of the early and absentee voting practices of each county, they’ll be more likely to vote, and Democrats will have higher turnout. Here’s where the confusion and misinformation part becomes crucial. Certain political forces are hard at work in the state to make sure that lies persist about voting practices. Democrats should be waging all-scale war on these phonies, and getting into neighborhoods to correct and inform. If we push and publicize early voting, it gives people more options and better ability to get to the poles. Keep in mind that early voting is a relatively recent practice… elderly citizens may not understand what it is. They see the one election day, and think that’s the only time they can vote. We have to change this. Seriously, the main game is moving to these 12 counties. In the 4 largest listed above, we know that 1.4 million people didn’t vote. Obama lost Texas by 940,000 votes. If Democrats focus on registration and information, this problem can be solved, and we can eradicate GOP majorities in these counties. As red as the state may look on paper, the real population and political power centers around the major urban areas. If we can maximize voter turnout in the 12 target counties, Democrats will win the state. So fellow Leftists… who’s ready to Think SWING?